Teamwork and Pay It Forward Speaker Conor Cunneen talks about Potted Plants!!!! Here, this lyrical Chicago based Irishman demonstrates the power of paying it forward and how it can truly build enhanced Teamwork. 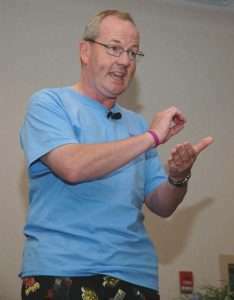 Conor Cunneen – Motivational Teamwork Speaker Dental Medical Practice. To Book Conor or just to check if the brogue is real! In another humorous but insightful video, Conor demonstrates how you can Choose your Attitude in even the most trying situations! Customer Service Speaker Dental Practice. PHONE Conor at 630 718 1643 (You’ll find the brogue is genuine) or simply complete the form below.